During the First World War, Germany lagged behind her rivals in sending aircraft to sea. No warship carried seaplanes during the early years of World War One, but both Russia and Britain converted liners and other ships into very useful seaplane carriers within a few months of the war’s outbreak. Germany deployed some very slow freighters as seaplane tenders, but these were used as mobile seaplane bases rather than actual carriers. Only toward the war’s end were two cruisers converted to hybrid seaplane carriers. In addition, naval planners drafted a very sophisticated design to convert the passenger liner Ausonia into an full-decked aircraft carrier. However, nothing came of this plan and the Weimer Republic’s navy lost interest in aircraft carriers. Germany would not operate any aircraft carriers during the next war, either, but it did try to build two of them and almost completed one. This ship, the Graf Zeppelin, appears in Second World War at Sea: Bismarck along with her projected sister ship, Peter Strasser, with scenarios allowing players to explore how aircraft carriers might have helped the German war effort (hint: not much). Graf Zeppelin shortly after launch. When the Nazis came to power in 1933, they found that the Reichsmarine had an expansion program already quietly under way. However, the proposed fleet lacked aircraft carriers. Engineer Wilhelm Hadeler, the 36-year-old wunderkind of German naval architects, was tapped to draft a ship to fill this need, and he responded with a plan for a 22,000-ton ship carrying 50 planes. She would carry eight 8-inch guns in casemate mounts set rather low on the hull, later replaced by double mounts with 5.9-inch guns. While Hadeler’s design was somewhat backward in its heavy armament, he foresaw later developments by including a substantial anti-aircraft armament: 10 4.1-inch anti-aircraft guns (Germany did not produce a dual-purpose naval gun until very late in the war) and dozens of small-caliber automatic weapons. The Anglo-German Naval Agreement of 1935 allowed Germany to build warships adding up to 35 percent of the total British tonnage in each given category, and this caused Hadeler’s design to be shelved. Instead, the Navy now wanted two aircraft carriers of 19,500 tons each, to equal the allowable treaty tonnage. The actual design came in at 23,450 tons. The anti-aircraft armament now became 22 37mm guns and seven, eventually raised to 28, of the same 20mm Oerlikon guns mounted on American carriers (the looming war was already being very good to Swiss arms makers). Designing a carrier frustrated the new German team, who slipped a couple of engineers into the delegation visiting Britain’s “Navy Week” in 1935. They snapped pictures of the British carrier Glorious and even wrangled a tour of her near-sister Furious. Both ships had short flying-off decks in front of the main flight deck, something missing from Hadeler’s design. The British were already planning to give up this anachronism and mount anti-aircraft weapons there, but the Germans never realized this and fell into disagreement over whether their carrier should have this feature as well. Some weeks later, this was settled when the Japanese agreed to give a tour of their carrier Akagi and access to their naval architects. Akagi had just been moved into Sasebo Navy Yard to remove her similar flying-off deck and extend her flight and hangar decks forward. Japanese engineers appear to have tried their best to help the Germans, handing over over 100 blueprints of Akagi and apparently of Soryu as well, then under construction in Kure. With these lessons incorporated into the design, Flugzeugträger A began construction (German practice did not recognize “keel laying” as a significant milestone) on 26 December 1936 at Deutsche Werke in Kiel, taking over the slipway cleared three weeks earlier by the launch of the battle cruiser Gneisenau. Per German practice, she did not officially receive a name at first, and was later christened Graf Zeppelin in honor of the developer of airship travel. By April 1940 she was 90 percent complete, but the engineers still had not solved the problems of catapult design and arrester gear. The ever-helpful Japanese could offer no assistance this time: Japanese carriers did not use catapults, and the Imperial Navy’s architects advised the Germans to forego them as well. Air Force technical experts (a politically important part of the design team, as the Luftwaffe controlled all that flew in Germany’s military) insisted that a catapult would be necessary to launch the heavier combat planes foreseen in the future. Flugzeugträger B (following both Imperial and Weimar practice, the Nazi navy assigned letter codes to additions to fleet strength, and Ersatz or “Replacement” names to those ships replacing old units) began construction in 1938 at Germaniawerft, another private yard in Kiel, on the slipway vacated by the cruiser Prinz Eugen. German engineers planned to build her more slowly than Graf Zeppelin, to take advantage of any lessons learned from building the first carrier. Though never officially named, all understood that this second ship would be called Peter Strasser, after the head of the German Naval Airship Division who died while bombing England in 1918. Two more carriers of the same design, prosaically named C and D, were to begin construction in April 1941 in the same yards and complete in July 1944. Construction stopped on carrier B in September 1939, when she was complete up to her armored deck and in February 1940 scrapping began. 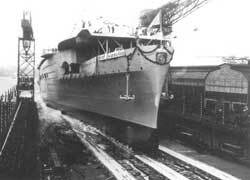 She had been scheduled to launch in July 1940, and complete at the end of 1941. Work stopped on Graf Zeppelin in April 1940 with the yard estimating the carrier to be 90 percent complete. Her 5.9-inch guns were removed and shipped to Norway for emplacement in coastal batteries. In July the nearly-complete hull was towed to Gotenhafen, the former Polish port of Gydnia, to be laid up there in a location less likely to suffer enemy air attacks. In Gotenhafen she became the Navy’s repository for the wooden fittings removed from warships before the war to reduce the danger of fire: fine tables, pianos, teak paneling and similar items now filled the hangar deck. Fear of Soviet air attacks caused the navy to move her again in the spring of 1941, this time to Stettin, and she returned to Gotenhafen that fall. Not long afterward, Japanese victories in the Pacific made an impression on Adolf Hitler. Germany’s supreme leader issued orders in March to complete Graf Zeppelin and build more carriers as well. Work resumed on Graf Zeppelin in July 1942, and in December the carrier returned to Kiel. But in January new orders stopped the work to divert labor and materials to the submarine program, and in April the carrier returned to Stettin for good. On 24 April 1945 the Germans attempted to scuttle the ship in Stettin’s harbor, but had trouble towing the hulk through the thick smoke choking the port area and she ran aground. She settled to the bottom only half-sunk, and the Soviets raised her the next spring. Now reduced to the status of barge, the ship with a load of captured weaponry was towed to Leningrad in 1947, but ran onto several mines in the Gulf of Finland during rough weather. The upper works were dismantled and scrapped there, and the badly damaged hull was torpedoed by Soviet destroyers as a target sometime in 1948 or 1949.